Hockey | That's a Clown Hypothesis, Bro! I was trawling for some stats on hockey-reference (whence most of the hockey facts in this post) the other day and ran into something unexpected: Bill Guerin’s 2000-01 season. Specifically, Guerin led the league with 85 games played. Which wouldn’t have seemed so odd, except for the fact that the season is 82 games long. How to explain this? It turns out there are two unusual things happening here. Perhaps obviously, Guerin was traded midseason, and the receiving team had games in hand on the trading team. Thus, Guerin finished with three games more than the “max” possible. What about going back farther? The season was 80 games from 1974–75 to 1991–92, and one player in that time managed to rack up 83: the unknown-to-me Brad Marsh, in 1981-82, who tops Guerin at least on a percentage level. Going back to the 76- and 78-game era from 1968-74, we find someone else who tops Guerin and Marsh, specifically Ross Lonsberry, who racked up 82 games (4 over the team maximum) with the Kings and Flyers in 1971–72. (Note that Lonsberry and Marsh don’t have game logs listed at hockey-reference, so I can’t verify if there was any particularly funny business going on.) I couldn’t find anybody who did that during the 70 game seasons of the Original Six era, and given how silly this investigation is to begin with, I’m content to leave it at that. What if we go to other sports? This would be tricky in football, and I expect it would require being traded on a bye week. Indeed, nobody has played more than the max games at least since the league went to a 14 game schedule according to the results at pro-football-reference. Tiebreaker games are counted as regular season games. Maury Wills holds the raw record for most games played with 165 after playing in a three game playoff for the Dodgers in 1962. Ties that were replayed. I started running into this a lot in some of the older data: games would be called after a certain number of innings with the score tied due to darkness or rain or some unexplained reason, and the stats would be counted, but the game wouldn’t count in the standings. Baseball is weird like that, and no matter how frustrating this can be as a researcher, it was one of the things that attracted me to the sport in the first place. So, those are my excuses if you find any errors in what I’m about to present; I used FanGraphs and baseball-reference to spot candidates. I believe there’s only been a few cases of baseball players playing more than the scheduled number of games when none of the games fell into those two problem categories mentioned above. The most recent is Todd Zeile, who, while he didn’t play in a tied game, nevertheless benefited from one. In 1996, he was traded from the Phillies to the Orioles after the O’s had stumbled into a tie, thus giving him 163 games played, though they all counted. The only other player to achieve this feat in the 162 game era is Frank Taveras, who in 1979 played in 164 games; however, one of those was a tie, meaning that according to my twisted system he only gets credit for 163. He, like Montanez, missed an opportunity, as he had one game off after getting traded. Those are the only three in the 162-game era. While I don’t want to bother looking in-depth at every year of the 154-game era due to the volume of cases to filter, one particular player stands out. Ralph Kiner managed to put up 158 games with only one tie in 1953, making him by my count the only baseball player to play three meaningful games more than his team did in baseball since 1901. Since Bellamy is the only person I’ve run across to get 6 extra games in a season and nobody from any of the other sports managed even 5, I’m inclined to say that he’s the modern, cross-sport holder of this nearly meaningless record for most games played adjusted for season length. Ending on a tangent: one of the things I like about sports records in general, and the sillier ones in particular, is trying to figure out when they are likely to fall. For instance, Cy Young won 511 games playing a sport so different from contemporary baseball that, barring a massive structural change, nobody can come within 100 games of that record. On the other hand, with strikeouts and tolerance for strikeouts at an all-time high, several hitter-side strikeout records are in serious danger (and have been broken repeatedly over the last 15 years). This one seems a little harder to predict, because there are factors pointed in different directions. On the one hand, players are theoretically in better shape than ever, meaning that they are more likely to be able to make it through the season, and being able to play every game is a basic prerequisite for playing more than every game. On the other, the sports are a lot more organized, which would intuitively seem to decrease the ease of moving to a team with meaningful games in hand on one’s prior employer. Anecdotally, I would also guess that teams are less likely to let players play through a minor injury (hurting the chances). The real wild card is the frequency of in-season trades—I honestly have no rigorous idea of which direction that’s trending. So, do I think someone can take Bellamy’s throne? I think it’s unlikely, due to the organizational factors laid out above, but I’ll still hold out hope that someone can do it—or at least, finding new players to join the bizarre fraternity of men playing more games than their teams. This entry was posted in Baseball, Baseball History, Basketball, History, Hockey, Oddities, Trivia and tagged multisport, records, Walt Bellamy on March 11, 2014 by clownhypothesis. Do Low Stakes Hockey Games Go To Overtime More Often? So that’s exactly what teams have learned to do. From 1983-84 until the 1998-99 season, 18.4 percent of games went to overtime. Since the loser point was introduced, that number has up to 23.5 percent. 11 That’s far too big a jump to be a coincidence. More likely, it’s the result of an intentional, leaguewide strategy: Whenever possible, make sure the game gets to overtime. In fact, if history holds, this is the time of year when we’ll start to see even more three-point games. After all, the more important standings become, the more likely teams will be to try to maximize the number of points available. And sure enough, this has been the third straight season in which three-point games have increased every month. In each of the last three full seasons, three-point games have mysteriously peaked in March. I’m somewhat unconvinced of this, given that later in the year there are teams who are tanking for draft position (would rather just take the loss) and teams in playoff contention want to deprive rivals of the extra point. (Moreover, teams may also become more sensitive to playoff tiebreakers, the first one of which is regulation and overtime wins.) If I had to guess, I would imagine that the increase in ties is due to sloppy play due to injuries and fatigue, but that’s something I’d like to investigate and hopefully will in the future. Still, McIndoe’s idea is interesting, as it (along with his discussion of standings inflation, in which injecting more points into the standings makes everyone likelier to keep their jobs) suggests to me that there could be some element of collusion in hockey play, in that under some circumstances both teams will strategically maximize the likelihood of a game going to overtime. He believes that both teams will want the points in a playoff race. If this quasi-collusive mechanism is actually in place, where else might we see it? The other team gets one point instead of zero. Because the two teams are in different conferences, this has no effect on whether either team makes the playoffs, or their seeding in their own conference. The only way it matters is if a team suspects it would want home ice advantage in a matchup against the team it is playing…in the Stanley Cup Finals, which is so unlikely that a) it won’t play into a team’s plans and b) even if it did, would affect very few games. So, from this perspective there’s no incentive to win a 2 point game rather than a 3 point game. Regulation and overtime wins are a tiebreaker. However, points are much more important than the tiebreaker, so a decision that increases the probability of getting points will presumably dominate considerations about needing the regulation win. Between 1 and 2, we suspect that one team benefits when an interconference game goes to overtime, and the other is not hurt by the result. The two teams could be competing for draft position. If both teams are playing to lose, we would suspect this would be similar to a scenario in which both teams are playing to win, though that’s a supposition I can test some other time. So, it seems to me that, if there is this incentive issue, we might see it in interconference games. So our hypothesis is that interconference games result in more three point games than intraconference games. Using data from Hockey Reference, I looked at the results of every regular season game since 1999, when overtime losses began getting teams a point, counting the number of games that went to overtime. (During the time they were possible, I included ties in this category.) I also looked at the stats restricted to games since 2005, when ties were abolished, and I didn’t see any meaningful differences in the results. My idea was that we would see more overtime games, not more shootout games, as it’s unclear how the incentives align for teams to prefer the shootout, but I looked at the numbers anyway. Since 2005, 14.2% of interconference games have gone to the skills competition, compared to 13.0% of intraconference games. 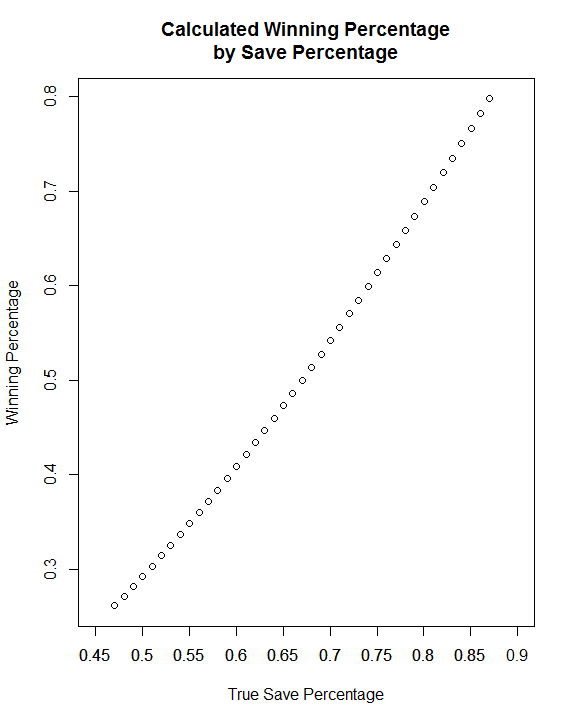 Not to repeat myself too much, but that’s still not significant (p = 0.23). Finally, even if we look at shootouts as a fraction of games that do go to overtime, we see no substantive difference—57.6% for interconference games, 56.3% for intraconference games, p = 0.69. So, what do we conclude from all of these null results? Well, not much, at least directly—such is the problem with null results, especially when we are testing an inference from another hypothesis. It suggests that NHL teams aren’t repeatedly and blatantly colluding to maximize points, and it also suggests that if you watch an interconference game you’ll get to see the players trying just as hard, so that’s good, if neither novel nor what we set out to examine. More to the point, my read is that this does throw some doubt on McIndoe’s claims about a deliberate increase in ties over the course of the season, as it shows that in another circumstance where teams have an incentive to play for a tie, there’s no evidence that they are doing so. However, I’d like to do several different analyses that ideally address this question more directly before stating that firmly. This entry was posted in Hockey, Research, Rules and tagged Grantland, incentives, Sean McIndoe, ties on January 21, 2014 by clownhypothesis.